The agency completed the drafted report in late 2016, yet it continues to stonewall. This is hugely problematic, because even though we have long known about the hazards of formaldehyde, this new report paints formaldehyde as much more dangerous and carcinogenic than we previously believed. The report links formaldehyde inhalation with a greater risk of developing nose and throat cancer, leukaemia, and other diseases. Essentially, this new report could lead to stricter regulations, which would be a win for all consumers. It’s been a long time coming. The National Toxicology Program has already deemed formaldehyde a known human carcinogen. Yet, companies continue to use it widely in manufacturing. And eventually, it winds up off-gassing into the air of our homes. Until the EPA gets its act together and starts putting stronger regulations on formaldehyde, educate yourself. Here are some of the most common household items that contain formaldehyde and tips for reducing your daily exposure. Most mattresses are made from polyurethane foam, which is petroleum-based. This foam is often infused with formaldehyde resin. The same is usually true for foam pillows. 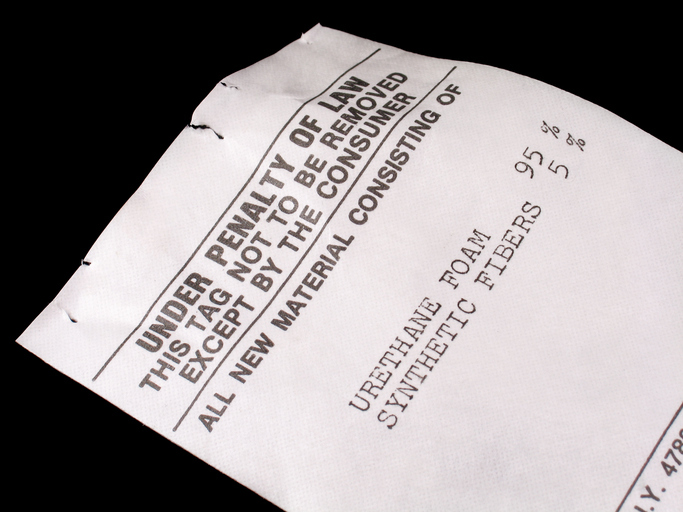 Any sheets that are “wrinkle-free” or “permanent press” are usually treated with a formaldehyde resin. Since you are spending a third of your life in bed, you probably don’t want to be breathing in carcinogens every time you get snuggly. Instead, look for organic bedding. There are plenty of conscious, chemical-free brands out there, though they do tend to cost a little extra. Formaldehyde is widely used in the glue that holds particle boards together. Choose furniture made from real wood or choose used furniture which has likely already off-gassed the bulk of its formaldehyde. And if you’d like to avoid toxic flame-retardant chemicals while you’re at it, look for new furniture with this helpful label. Artificial fragrances are loaded with chemicals, including formaldehyde. Do you really want to be spraying carcinogens into your bathroom air? Instead, opt for natural essential oil-based options, like clean soy or coconut wax candles or wonderful, non-toxic sprays like punny Poo-Pourri. Unless you’re actively buying clean, chemical-free nail polish brands, you may be inadvertently painting your nails with a cocktail of toxic chemicals. Nail polish contains the highest density of formaldehyde of any consumer products—up to five percent. And the same goes for nail polish remover, which is practically paint stripper. Always go the non-toxic route. If your fabric is shrink-resistant (especially wool), color-fast, stain resistant, or waterproof, it has most likely been treated with a formaldehyde resin. Currently, formaldehyde is nearly unavoidable in your daily life. So, take extra precautions around your house to keep the air fresh. Test your indoor air quality here. Keeping your house low-humidity, freshening the air with open windows for a few minutes each day, and using a quality air purifier that reduces VOCs (volatile organic compounds) like formaldehyde are good practices to adopt. And overall, be a more conscious consumer, because sometimes regulation come too late.